Welcome to 716 Vernon ideally located on a spacious double lot, near Hawk Island Park and the River Trail. 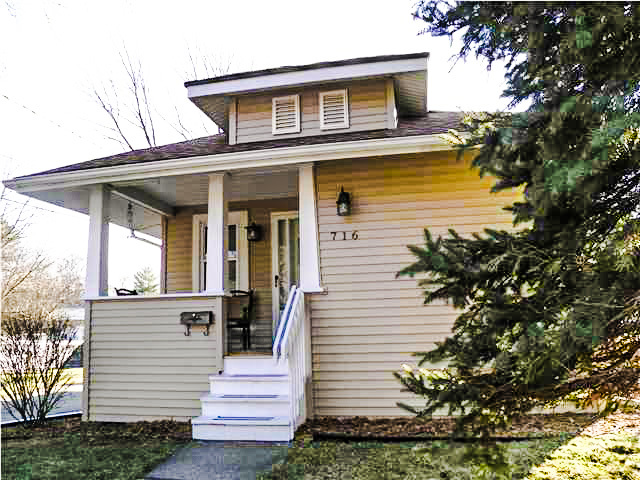 This spacious 2 (possible 3) bedroom 2 bath bungalow has great curb appeal with a well-manicured lawn and is bordered by perennials and cherry trees. Upon entering, take notice of the unique glass door knobs, crown molding and hardwood floors in the living and dining rooms Storage space is never scarce with all the closets and space-saving built-ins, which also adding to the charm and character of this very cute home. The kitchen has been updated with new cabinets, counter tops and appliances. The 2 bedrooms on the main level both have hardwoods floors and the master features a huge walk-in closet. Full bath on the main level has been nicely updated. The basement features a kitchenette, family room, den and full bath. The den is currently being used as a third bedroom and office. Freshly painted, this home is move in ready. New furnace and water heater in 2007. The large double lot is fenced-in and there is a detached 2 car garage. For additional information on this property click here! Posted on July 8, 2013, in Home. Bookmark the permalink. Leave a comment.